Tension is the enemy of good playing. It is amazing what tension can do to a performance . . . to a lesson . . . to a practice session. First, it is vital that you enter your practice session relaxed. One way to go about this is to set up a special place for practice where you will not be interrupted and where you can, for a little while, forget about what else is going on. Second, stretch before you pick up your violin. Playing a violin is a physical activity. Athletes stretch before they perform, so should you! Third, establish a routine for the start of the practice. Do the same thing over and over again every practice . . . even for just a minute or ninety seconds. This allows you to enter a familiar, relaxed state of mind. It allows you to stop thinking about other things and concentrate on what is important at that moment . . . your violin practice. Once or twice during each lesson or practice take a moment to put down the violin, stretch, shrug and roll your shouders, and shake the tension from your hands and forearms. If you are having trouble and don't seem to be making any progress, stop and stretch for a moment. Here's a Practical addition to your Kitchen Magnet Collection. Each morning turn the magnet so that you can read the words, "No Practice Yet. 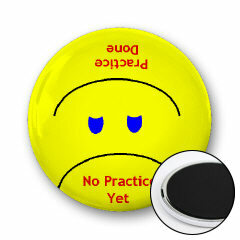 When practice is finished, have the student turn the magnet so that you can read, "Practice Done." (Move Your Mouse Over the Picture at the Right) Another little reward for a good job practicing violin. Click Santa to Take a Look at Some Great Gift Suggestions for Musicians!